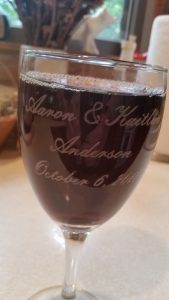 Home › Personalized Gifts › Cheers to you! When Aaron and Kaitlyn were planning their wedding, they wanted to thank their guests by providing them with a memorable item from their special day. 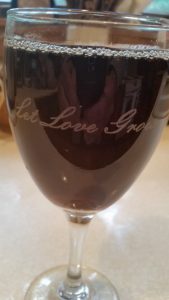 They picked a wine glass etched with their names, wedding date, and “Let Love Grow” on the back.